ISA, International Shipyard Ancona, has recently launched "Ellix Too", a 47-metre pleasure boat fitted out with the most up-to-date systems technology has to offer for optimising sailing performance, the level of well-being on board for guests, etc. High-tech has also been used for connections and multi-media entertainment systems with the adoption of a system specially developed by the Italian Radiomarelli Multimedia in collaboration with Videoworks, official installer for this Italian apparatus. The owner and his guests on "Ellix Too" can count on complex yet easy to use equipment, thanks to user-friendly intuitive interface. 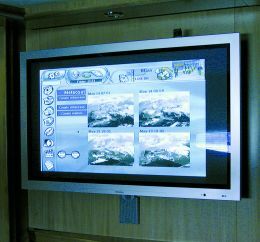 Radiomarelli has therefore fine-tuned a system that meets various requirements such as that independent control from any room on board of all the options of the system itself, including internet connection, vision of films and programmes on DVD or satellite channels, voice and digital communication, management and visualisation of information relative to sailing, high-speed digital connections both land and satellite. All this has been made possible thanks to the potential offered by the central control station developed by Radiomarelli for this very purpose. This station dialogues with the peripheral equipment in each single room on the yacht in a completely independent way, thus being able to guarantee multiple, different link-ups. Radiomarelli is a global satellite provider able to assist GPRS and UMTS data exchange, thanks to which speed of traffic is always high and offers the owner and his guests the possibility of staying in contact with the shore even for business, regardless of the yacht's activity. This Italian company is also a Telenor Satellite Services Provider, specialised in the new communications standards such as UMTS/3G and satellite IP, the latter offered by new-generation Inmarsat I-4 for BGAN or Broadband Global Area Network services. In practice, the platform developed by Radiomarelli is complex in structure, complete in its range of communication and entertainment, but at the same time easy to use thanks to its simple interfaces. Describing the Radiomarelli system in detail would call for a lot of space, but what we are interested in having our readers note is its potential for high- speed communications in all the modes currently available, as well as the company's flexibility thanks to which it can develop systems for any kind of yacht and need. For further details: mmy@videoworks.it; tel. +39 071 2868170.